Today, on the day of his martyrdom, Nov. 12, Roman Catholics and some Eastern Catholics remember St. Josaphat Kuntsevych, a bishop and monk whose example of faith inspired many Eastern Orthodox Christians to return to full communion with the Holy See. Other Eastern Catholics, including the Ukrainian Catholic Church, celebrate St. Josaphat's feast day on Nov. 25. Born in 1580 in the western Ukrainian region of Volhynia, John Kuntsevych did not become “Josaphat” until his later life as a monk. He also was not initially a full member of the Catholic Church, born to Orthodox Christian parents whose church had fallen out of communion with the Pope. Although the Eastern churches began to separate from the Holy See in 1054, a union had existed for a period of time after the 15th century Ecumenical Council of Florence. But social, political and theological disputes caused the union to begin dissolving even before the Turkish conquest of Byzantium in 1453. By John’s time, many Slavic Orthodox Christians had become strongly anti-Catholic. During this time, Latin missionaries attempted to achieve reunion with the individual eastern patriarchs. The approach was risky, sometimes politicizing the faith and leading to further divisions. But it did yield some notable successes, including the reunion of John’s own Ruthenian Church in the 1596 Union of Brest. John was trained as a merchant’s apprentice and could have opted for marriage. But he felt drawn to the rigors and spiritual depth of traditional Byzantine monasticism. Taking the monastic name of Josaphat, he entered a Ukrainian monastery in 1604. The young monk was taking on an ambitious task, striving to re-incorporate the Eastern Orthodox tradition with the authority of the Catholic Church in the era of its “Counter-reformation.” Soon, as a priest, subsequently an archbishop, and ultimately a martyr, he would live and die for the union of the churches. While rejecting the anti-Western sentiments of many of his countrymen, Josaphat also resisted any attempt to compromise the Eastern Catholic churches’ own traditions. Recognizing the urgent pastoral needs of the people, he produced catechisms and works of apologetics, while implementing long overdue reforms of the clergy and attending to the needs of the poor. Josaphat’s exemplary life and zeal for the care of souls won the trust of many Orthodox Christians, who saw the value of the churches’ union reflected in the archbishop‘s life and works. Nevertheless, his mission was essentially controversial, and others were led to believe lurid stories and malicious suggestions made about him. In 1620, opponents arranged for the consecration of a rival archbishop. He finally did so, on a fall day in 1623. An Orthodox priest had been shouting insults outside the archbishop’s residence, and trying to force his way inside. Josaphat had him removed, but the man assembled a mob in the town. They arrived and demanded the archbishop’s life, threatening his companions and servants. Unable to escape, Josaphat died praying for the men who shot and then beheaded him before dumping his body in a river. 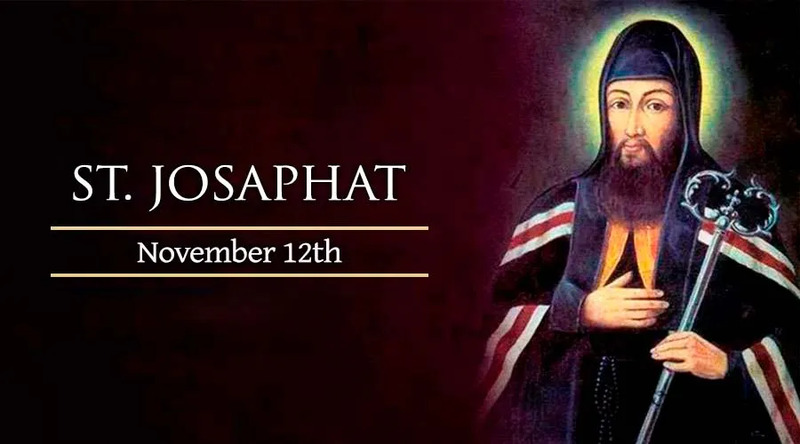 St. Josaphat’s body was discovered incorrupt, five years later. Remarkably, the saint’s onetime rival - the Orthodox Archbishop Meletius - was reconciled with the Catholic Church in later years. St. Josaphat was canonized in 1867.